Links Golf Ireland is a sister company of Emerald Custom Tours, and arranges trips that meet the same high standards. If you are considering a golf vacation in Ireland or Britain, look no further. The key difference with Links Golf Ireland is that we are owner/operators of the transportation used on our tours – we can offer competitive rates while providing golf travel services on a par with the best. Golf tee times, luxury transportation and a variety of tried and tested accommodations are the core of our package options. In addition, we arrange caddies, sightseeing, dining and all the finer details to exceed your expectations. As a member of The Emerald Elite Group, we have the support of an experienced team of travel professionals to deliver on our promise. We are managed by people with a true passion for golf, and it shows. Over one third of the world's links golf courses are located in Ireland – with over 400 options, you’ll find an excellent variety to suit every type of vacation. 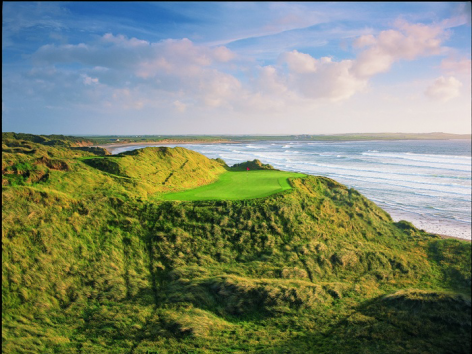 We plan golf trips the length and breadth of Ireland and Britain – from Old Head of Kinsale to Ballybunion, Royal County Down to the Royal Liverpool, we will arrange your trip with every detail in mind. Our bespoke golf vacations are unique and best described through the many testimonials we have received from past tour clients. Golfing here with us is an experience you will talk about and cherish forever. And, of course, you can't mention the venerable and respected game of golf without thinking of Scotland, where golf originated back in the 15th century. We offer custom and group tours to Scotland's most legendary courses, including Royal Dornoch, Royal Troon, Turnberry Resort, Kingsbarns, St. Andrews, and Carnoustie Golf Links.